Our work is guided by our three point platform and our Points of Unity. The platorm demands that Pennsylvania stop building prisons, reduce the prison population, and reinvest money in our schools and communities. The platform has been endorsed by almost 100 organizations across the state. At a time when many other states across the country are exploring ways to shrink their prison population and close unnecessary facilities, Pennsylvania is moving in the opposite direction. Governor Corbett intends to spend $685 million to expand the state’s already massive prison system. This money is funding the construction of three new state prisons and the expansion of nine others. It will add 8,000 new beds to our prison system at a time when the governor cut $951 million in education spending, along with massive cuts to a host of other essential programs and services. We believe this is unacceptable, and so we came together to fight the proposed expansions. You can see a map of all the expansion projects and how much they cost here. 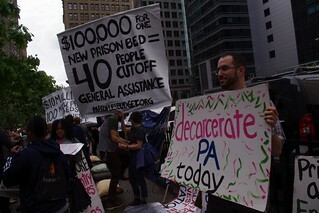 DPA formed in 2011 to challenge the expansion of Pennsylvania’s prison system amid drastic cuts to public education, social services and health care. Seeing a chance to shift the state’s criminal justice priorities, we set out to build a campaign to shrink the prison system and expand the community institutions that actually keep us safe—education, housing, reentry, and health care. In the short time since our founding, we have launched our three point platform demanding “no new prisons, decarceration, and community reinvestment,” which has been endorsed by 85 organizations across the state. We held protests at corporations who are profiting from the prison expansion, and we rallied near the prison gates. 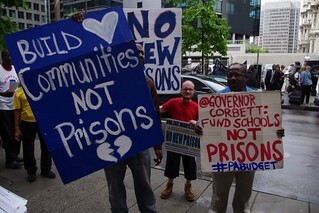 We’ve worked with allied groups to protest governor Corbett’s appearances in Philadelphia, we started a social media campaign to outline the real cost of prison expansion and Corbett’s budget priorities on schools, healthcare, social services and the environment. We’ve debated Department of Corrections Secretary John Wetzel on WHYY, the local NPR affiliate, and we’ve had letters and opinion pieces published in all four of the state’s largest newspapers. We launched the “Missing” campaign to highlight the connections between incarceration and immigrant detention, held multiple call-in days to flood the governor’s office with phone calls demanding meaningful sentencing reform and an end to prison construction, spoken at dozens of events, rallies and meetings, gotten hundreds of petitions signed, and appeared on the radio and on TV news. We held a public tribunal to put the Pennsylvania Prison System on trial, where people gave testimony about the negative impacts of the prison system on themselves and their families and communities. And on that same day, seven members of Decarcerate PA staged an act of civil disobedience to block the entrance to the prison construction site, stopping prison construction for over an hour. And we’ve had some major victories. Just this January, the Corbett administration announced they are planning to close two prisons in the western part of the state. Check out our calendar for upcoming meeting dates and events, or to find out about meeting and events in other cities and towns in PA. You can also email us with any questions at decarceratePA@gmail.com or give us a call at (267) 217-3372. If you want to receive monthy announcements about upcoming events, join our announcements listserve by entering your email in the box in the column on the right!